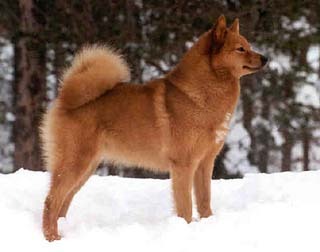 With its red coat and kind face the Finnish Spitz is a uniquely beautiful breed. Originally used to hunt small game and birds the Finnish Spitz is a well-balanced medium sized dog. Square in build they are about as long as they are tall with an energetic trotting gait that can swiftly change into a run when pursuing prey. 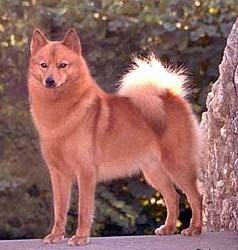 A coat of varying shades of red, small triangular ears that are held erect, a pointy muzzle, and almond shaped dark eye give this breed the fox-like appearance it is known for. This is a double-coated breed with a soft dense undercoat and longer harsh guard hairs. The tail curls over the back forming a dense plume. Both the coat and tail indicate that this is a member of the Spitz family. Height (Male) 17 - 20"
Common Misspellings Finish Spitz, Finnish Spits, or Finnesh Spitz. The Finnish Spitz is active, alert and intelligent, but it can also be rather stubborn and independent. Easily bored by repetition, these dogs need fun, fast training sessions, and owners should understand that this breed will never be as biddable as a lab. They were bred to bark constantly while on the hunt and modern day dogs remain highly vocal, making them excellent watchdogs. However the Finnish Spitz needs to be taught to stop barking on command or this habit will swiftly become annoying. These dogs can make good pets, but due to their vocality and independent nature, they are not for everyone. However, a good brushing once a week to remove dead hair will help keep the coat in top condition. Despite their thick coat these dogs can handle a surprisingly wide variety of weather conditions. 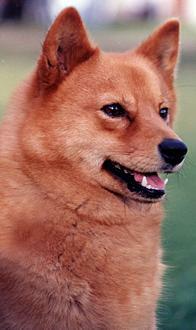 The Finnish Spitz is an active breed and must be allowed to burn off its energy. Otherwise, the dog will find its own outlets, which usually involve destroying its owners home. The Finnish Spitz is a great pet for active people who want a dog they can run or hike with. Hereditary illness is virtually unknown in the Finnish Spitz, and only rarely will one see health problems such as canine hip dysplasia, epilepsy and patellar luxation. The dog migrated north thousands of years ago with some of the first human inhabitants of modern Finland. In frozen isolation, the Finnish Spitz remained pure and unchanged by man until the 19th century, when it became so interbred with other dogs it was nearly destroyed. Fortunately two Finnish sportsmen, Hugo Sandberg and Hugo Roos, noticed the Spitzs peril and worked to propagate pure bloodlines of the breed during the late 19th century. 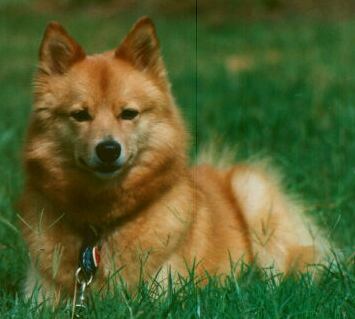 The Finnish Spitz was brought to England during the 1920s and the United States during the 1960s, where it was recognized by the American Kennel Club in 1991. 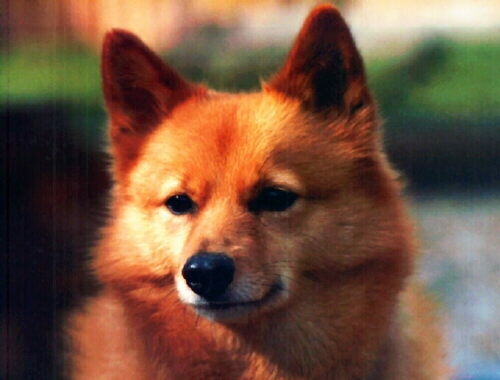 Away from its native home the Finnish Spitz is most commonly seen as a family pet and loving companion. In Finland, on the other hand, the dog is still used in much the same way it has been since time immemorial. The Finns primary quarry is a large turkey-like game bird called the capercaille, though the dog has also been used to hunt elk and even bears on occasion no small feat for a dog that rarely exceeds 40 pounds in weight. The dog hunts by locating prey and driving it into the open or back toward its master with loud, piercing barks. The Finnish Spitz is the national dog of Finland, where it is prized for its unique barking prowess.